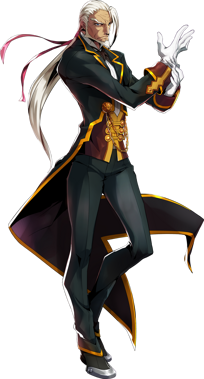 Difference between revisions of "Valkenhayn R. Hellsing"
Originally, Valkenhayn appeared as an NPC in ''[[BlazBlue: Calamity Trigger]]'' and was made playable as the second DLC character for ''[[BlazBlue: Continuum Shift]]''. 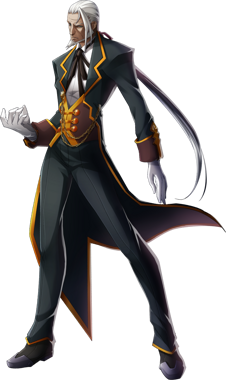 Valkenhayn's wolf form is that of a large gray wolf with black paws and a black face. The fur on its back, tail, and chin is the same color as Valkenhayn's hair in his human form, and his pink bow is situated on his tail.